Blindfold Games just for team building. 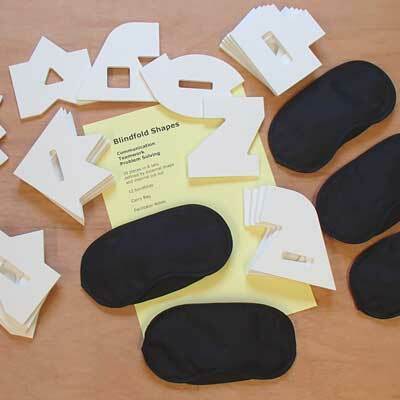 A range of blindfold games kits and blindfold games ideas for you to consider using in your team builds and events. A selection of ideas for blindfold games and team building activities with blindfolds and blindfold goggles and problem solving activities using blindfolds. We hope you find these blindfold games useful. Safety should be the number one priority when using blindfold games. These comments apply to all the games below. Prior to any blindfold game activity a site specific risk assessment should be carried out by a competent individual and approved by your health and safety officer. Blindfold games activities should be run by individuals with appropriate training and approved by your health and safety officer. Blindfold games activities should take place where there are no hazards such as hard objects or sharp corners. Blindfold games activities should take place on grass or other soft level surfaces. During blindfold games activities no one should move quicker than slow walking pace. A facilitator should be in attendance at all times to ensure that rules are followed and that there are no hazards. The sighted partner is there to provide safety and support for the person ensuring that they follow a safe route. This blindfold games activity works well early on in a session as an introduction or an icebreaker. Lay a thin rope line out on the grass. Use a rope about 10m long. Players are blindfolded one at a time and are challenged to walk the line. More points for getting further, losing points every time they step on the ground other than on the line. Group members are paired up. One is the Robot and the other is the Director. The Robot is blindfolded and is in the zone, the Director is sighted and stands just outside the zone. You could have up to four Robots in the zone at any one time thought it works well with just two. To score points the Director directs the Robot to the balls of paper (walking only, no running). They pick these up and then are directed to throw them (underarm only) at the other Robots. If they hit then the pair gets a point. Each game can last 5 minutes. The pair with the most points wins. Experience says that you need a referee to keep score and to ensure that balls are thrown gently and robots move slowly for safety purposes. Have fun. One person sits on the floor and round them are a number of items, some small, some larger, all interesting and nothing heavier than a football. The rest of the group stand at the edge of the room. Once the person sitting has put on a blindfold, then other group members take it in turns to try to retrieve an object. If they make noise and the person with blindfold hears them, then the blindfolded person points to them and says 'heard you', if they point at a person then that persons turn ends and it is on to the next person. Either let the game run till all the objects are gone or until an appropriate length of time has passed, say 10 minutes. Then another person, perhaps the one who retrieved the most objects, is selected to sit in the middle and be blindfolded and the blindfold game continues. For this blindfold game a marker is put on a clear space of grass. A person wears a blindfold and is then given a route to follow away from the mark. At the end of the route they are to retrace their steps. Then the blindfold is removed. The closer they are to the start point the better. Progression in this task is to make the route more complex for example start with 10 steps forward. The next route may be 5 steps forward and 5 steps to the left and so on. Works best with delegates working in pairs, one with blindfold and one sighted to check they don't go to far off track and to be beside them to give a steadying hand. A good progression in this blindfold games activity is to allow the sighted person to move. Typically this will need the blindfolded players to work together. 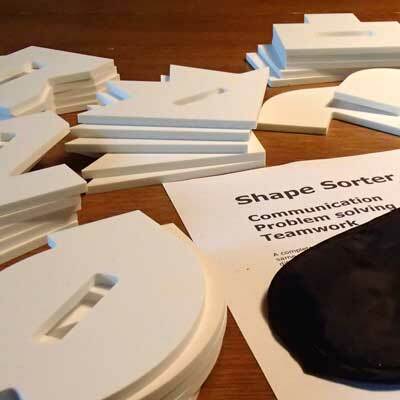 Blindfold games team building activity, great for groups of around 4 people. Shoe size order - Blindfold everyone for this blindfold game, then same as above but in order of shoe size. Mark out a trail with rope. The trail should include areas of sensory interest such as over grass, over soft floor mats, under a crawl net. Blindfold all members of the group then ask them to follow the rope staying together as a group by holding the back of the coat of the person in front of them. Great blindfold game. For this blindfold games use a large loop of rope, about 30m works well. A team of between 4 and 6 individuals should be asked to lay this loop on the ground in a specific shape such as a square or circle whilst all of them are blindfolded and in contact with the rope. For younger groups give them 20 minutes planning time and time for a couple of dry runs, all without blindfolds. For older groups just set them the task. Lay a large number of soft objects to be avoided on a grassed area. Amongst them place some soft objects to be retrieved. The in each pair one person is blindfolded and must be guided by the other to retrieve the targets without touching any of the mines. Easiest if the person doing the guiding can touch the other persons hand. Harder if they may only talk to them, harder again if the person guiding is on the edge of the blindfold games area. This blindfold game works well with groups of 10 and larger. Divide the group into subteams and give each sub team an animal type. Now ask every one to mingle together and then find their own space. Everyone should put blindfolds on at this point and on your signal to make the sound of their animal and find other people of the same type. Eventually everyone should end up with their own subteam. Can be used at the start of an event to form teams by giving everyone a piece of paper with their animal type written on it. Basic blindfold game- a leader calls out an object to be drawn, group members each have to draw that item while wearing blindfolds. Complex blindfold games - The leader is given a complex shape drawn with straight lines. They must communicate this shape to a drawer who is wearing a blindfold and get them to recreate the shape. Another blindfold game. Get the group sitting on the floor. Blindfold them. Give a box of items to the group leader and ask them to describe one at a time until all objects are identified by the group. The leader may not say the name of the object. One person wears a blindfold and must find other members of the group. This blindfold game is best used in a well defined area. Using a large picture or outline drawing of a donkey, each group member takes turns to pin a tail made of string on the donkey while wearing a blindfold. Start the individual about 3 metres from the drawing. Very traditional blindfold game. On grass, lay out a start and finish line with rope or tape. Contestants work in pairs, the person with the egg and spoon wearing the blindfold. The sighted person guides them down the course. Soft obstacles can make the game a bit harder. Great blindfold games alternative.